MELT seems much darker than your other YA novels. Talk a little bit about what inspired you to take these characters down a darker path? This is a fascinating question, and I pondered it for a bit before attempting an answer. At first I thought – yes, I guess this is true. And my second thought was that my evolution as a novelist has been downward, to deeper, darker territory. I ponder life’s questions, and this requires diving deep. But it took me time to gather the skills and fortitude to take that plunge. That said, I didn’t choose this subject – it chose me. Joey is based on my boxing coach, and every violent thing he witnesses in the book was related to me by him. He also had a “good girl” girlfriend. So, that dark path was laid down for me already, through Joe’s experience. I just had to follow it. In another magical element, THE WIZARD OF OZ passages presented themselves to me. Seriously, whenever I opened the book I encountered exactly the paragraph that worked for me. 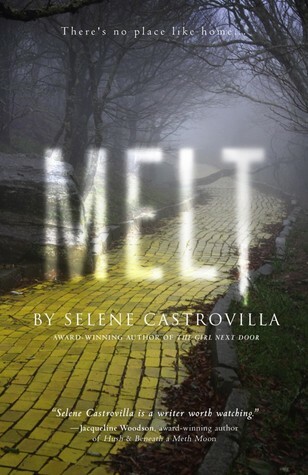 Even using THE WIZARD OF OZ as a metaphorical backdrop was not a conscious choice: a voice told me to buy the book, and it told me to open it on the night I started to write MELT. However, thinking about my previous books, I think they are “less dark” largely because of their narrators. Willow and Samantha tell those stories, and they are far less dark than Axel and Jesse. If we had heard from “the boys,” the stories would’ve had different tones for sure. Imagine MELT with only Dorothy narrating? It’s amazing how many ways there are to tell a story. I don’t really have a soundtrack in mind for MELT, but I often hear the song I MELT WITH YOU by Modern English in my head when I’m reading over passages. I’ve been hearing it a lot in various places, too. Dorothy and Joey hear it at one point in the book. Regarding daily word counts, I don’t have a requirement for myself like that – but I should! Once this launch is over I’m going to start setting daily goals. I used to be way more productive, but the last few years knocked me for a loop (Hurricane Sandy and a few other sad things I’ll spare you from.) Now I’m rising again! I think I may do a time requirement rather than a word count though, because I tend to edit as I write. I know people suggest not doing that – but I can’t help it. Anyway, my word count tends to be lower daily, but I’m happy with my work. To thine own self be true! If you follow my reviews at all around here, you'll know that I don't always go for the contemporary "bad boy" thing. Like, I have actively whined about that trope in the past. But something about Melt was very compelling to me based on the summary, so I decided to give it a chance, and boy am I glad I did. Told from the dual viewpoints of Dorothy and Joey, we follow them from their very first meeting. Yes, it is a bit insta-love at first, but I really grew to care about both of them so quickly that I got over it. Joey's sections are written in fascinating, scattered verse, which really helped to illustrate the frantic, terrifying world he lives in. Nothing for Joey is easy or straight-forward and it's reflected in the way his story is told. His sections are so hard to read because of the intense, traumatic violence he faces every day, and the baggage he carries with him because of it. Like I said, I don't always go for the bad boy thing. I think the whole "you can save someone with your love" plotline can be damaging if poorly executed, but Castrovilla really nails the relationship between Dorothy and Joey here in a way that made me buy into it. Dorothy wanted to save him, of course, but at the end of the day, Joey had to find the strength within himself to change. And at no point is this portrayed as an easy journey for Joey, which is what sold the plot for me. I want to see challenges and consequences and acknowledgment that stopping the cycle of abuse (physical, alcohol, etc.) isn't as easy as saying "things will be different now". I really enjoyed what Castrovilla said in our discussion above about imagining what the story would be like if only told from Dorothy's perspective. Dorothy is such a fresh, light voice and she really balances out the darker chapters from Joey's perspective. That contrast is really necessary, and I liked getting to see the same events through both of their eyes. I really felt for both of these characters over the course of the story, and I think you will, too. The book does contain mature themes, including physical/emotional abuse, alcohol/drug use, and sexual scenarios, so is recommended for older readers.